Synopsis: While contemplating whether or not to go through with her marriage, Alice stumbles into a hole into Underland. Sheil comes face to face with creepy people and talking animals. During her journey she learns that she was fated to come to Wonderland to restore the rightful ruler to the throne and do away with the evil queen. Tim Burton takes a classic story and adds his touch to create a good film. The great art work and acting with good guidance creates a good movie that ranks at 5th all-time in the box office. 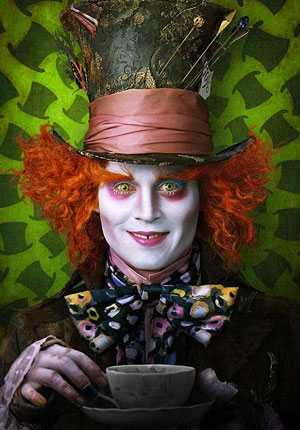 Burton's staple, Johnny Depp, nails his character again along with Wasolowska which also contributes greatly to the film. Although I don't think it's his best work, Burton still does a good job on this one.